Have 4 tilapia fillets, thawed, dried with a paper towel and seasoned with sea salt. Boil potatoes 5 minutes in a 4 quart pot of water until potatoes are just done. Drain the potatoes. 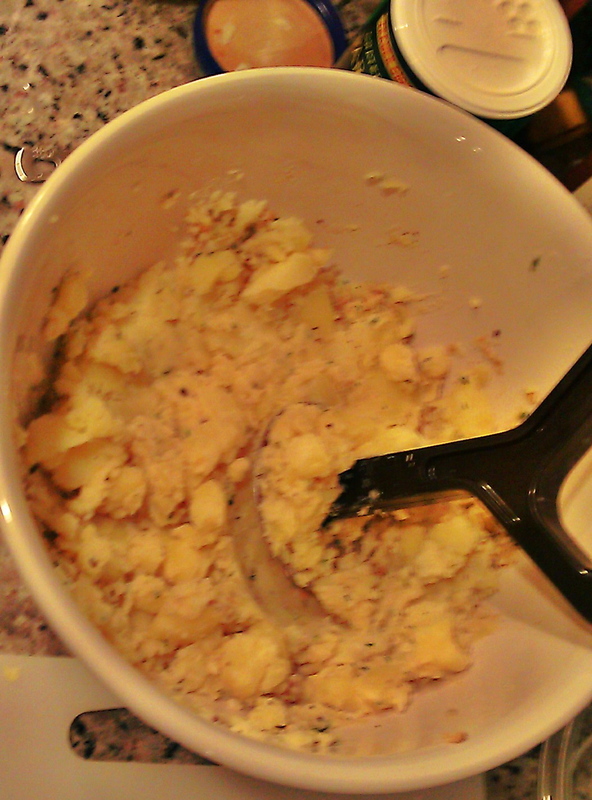 In a medium bowl add the potatoes, Parmesan, garlic, parsley, mayonnaise, salt and pepper. Mash until the potato becomes lumpy. 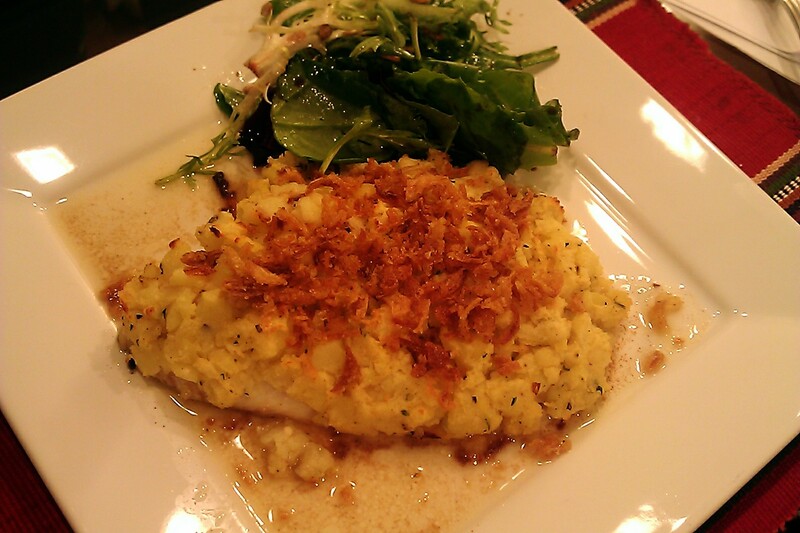 Place tilapia fillets in a baking dish and top with the potato crust until the entire top of the fillet is covered. Bake 12 minutes on center rack. Then broil (on same center rack) for 3 minutes to slightly brown the potatoes. Brown the butter in a skillet on LOW heat. Occasionally stir the butter with the skillet. The browning takes time so be patient. Don’t increase the heat to brown faster – it will only burn. Keep stirring the butter until it turns a brown amber color. Once browned add the lemon juice and wine. Simmer uncovered for 5 minutes, then immediately remove from heat. Plate the tilapia topped with fried onion pieces. Spoon the wine sauce around the fish and serve. My wife and I just finished our dinner with tilapia and it was “restaurant quality”. … I really shouldn’t look at this when I’m so hungry! Now that’s a different topping & one I’m going to have to try. I love the idea of the onion on top too. 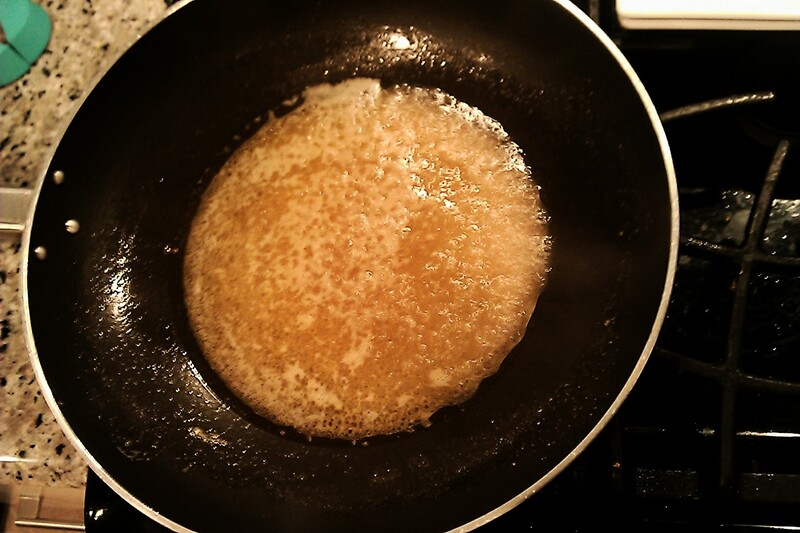 Thanks for the tip on the browned butter sauce – I think my problem has been trying to rush it. The butter will not seem to change color for a while but when it does it’s almost instant that it browns. It’s not gradual. Please do try. It’s a great topping. I’m going to & I have some other recipes that call for brown butter sauce. One is w/spaghetti squash. Guess this is one I’ll have to pay attention (for once). I think I will try this with local Triple Tail (black sea bas). Thanks! Please do! The recipe was a hit at home.